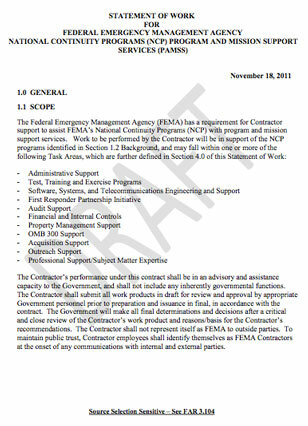 Within an hour of posting FEMA continuity of government plans, PDF pre-bid noticed deep sixed. ATTENTION: Agency users are responsible for properly uploading controlled, unclassified materials to FBO using the access control procedures for document packages and attachments detailed in the FBO Buyers Guide. Do not upload ANY classified materials to FBO. The government-linked document we posted was marked ‘Source Selection Sensitive’ but not considered classified. Further, it was listed publicly on a government website that was soliciting bids for government contracts. However, despite its public classification, it contains information that clearly is NOT intended to gain wide publicity. However, there are plenty of completely public Homeland Security and FEMA documents detailing parts of the secretive COG plans for a national emergency. Among these is the document we covered earlier, as this document reveals not only detailed aspects of the COG personnel relocation plans and martial law takeover of communications, but a plan to militarily-target Americans and designate them as enemy combatants– dramatically, through a blue/red high-tech surveillance matrix aimed at suppressing dissidents and occupying the homeland. The important clip above also documents numerous executive orders specifying a takeover of civil America. FEMA, and its overlord mother the Department of Homeland Security, have been given enormous powers, and are now beginning to use them. That’s why this new document is compelling enough for the government to cover up. FEMA camps are being staffed for stand-by operation– that’s what the recent KBR documents covered by Infowars.com show. Now, we find FEMA soliciting personnel to run a military-COG program that designates Americans as an enemy population. It is a perfect storm, timed with the Bill of Rights-destroying 2012 National Defense Authorization Act (NDAA) that puts on paper the indefinite detention of Americans without trial. Why don’t they want you to know? What HAS been exposed publicly points directly to overt takeovers of the constitutional government via martial law, the use of troops on the street (in violation of Posse Comitatus) and a definitive takeover of all communications, including the establishment of secure emergency communications lines for the the Continuity of Government controllers. More to the point, it validates the worst of fears– that rhetoric issued from political leaders in America demonizing its people as potential terrorists relates to real plans, albeit obscured from popular public knowledge, to target and indefinitely detain dissidents and other ordinary citizens any during declared emergencies, or for any pretext of national security. That’s right. The stuff out of cautionary tales like Seven Days in May, reviewed here by Alex Jones, and translated onto screen in 1964, has come true. Whether for a worthwhile pretext or not, plans have been put into place to transfer power outside of elected government. In its place is a constitution-circumventing framework to share power between the special interests who have bought/run the executive branch and legislative branch, including the National Security shadow powers given precedent there, including military and CIA capabilities.